It is with great joy that I can announce to you my new crochet along Nuts About Squares. I have been working on this quietly for more than a year and now the time has finally come to share my nutty project with you. Informal. To be very enthusiastic about an object, activity, or person. We are all nuts about something or someone; something that we really enjoy doing or someone that we love to hang around with. I love to crochet squares and hence the name Nuts About Squares was quickly born for this, my very first CAL. This CAL is not so much my design because the squares are designed by others, but it is my selection. Squares that appeal to me and that I consider beautiful. I did have some help choosing, testing and working out the details, but that I will tell later. You can find all relevant information HERE. We are making a blanket with 35 lovely squares designed by 11 talented crochet designers. Some of them are well known and admired for their fabulous designs, others are perhaps less known but I am sure you will love their designs also. Contributing designers are Dedri Uys, Helen Shrimpton, Polly Plum, Sigrun Hugoey, Melissa Green, Heather Gibbs, Julie Yeager, Margaret MacInnis, Susan Stevens/Mellie Blossom, Aurora Suominen, and Tatsiana Kupryianchyk. Each square has been carefully selected to ensure that the squares work together well in their look and feel. Most of the squares are textured and have an artistic look about them. There are three colorways available for this CAL, one in Scheepjes Color Crafter, one in Scheepjes Sunkissed and one in Scheepjes Stone Washed. Each colorway contains 6 colors and has its own look around the central theme “Earth, Sea and Sky”. The Color Crafter kit contains blue and green colors and is called “Nuts about the Sea”, the Sunkissed kit contains contrasting and deep colors and is called “Nuts about the Sky”, and the Stone Washed kit contains earthy colors and is called “Nuts about the Earth”. Depending on which kit you have and your personal tension your blanket will be approximately the following sizes. The Color Crafter blanket will be about 130cm x 180cm, the Stone Washed blanket about 115cm x 160cm, and the Sunkissed blanket about 100cm x 140cm. The kits are available from Wool Warehouse and Caro’s Atelier (NL). Thank you for supporting my work by buying your yarn through the links on my blog. If you have one of the three kits for this CAL you can follow the colorway that I will specify each week. However, you are more than welcome to follow your own colorway also. I will give more details about yarn amounts and tips for choosing colors next week. The CAL will last 15 weeks and starts March 31, 2017. During the first 12 weeks we will be making the squares, followed by 2 weeks for joining and one week for the border. Each week there will be English video tutorials to show you how to make the squares for that week as well as links to the original written patterns in English and Dutch. Each week I will have a post here on my blog with all the information you need for that week, for example which colors to use and links to the original patterns. On my YouTube channel you will also find the video tutorials. The CAL will be hosted by the Official CCC Social Group on Facebook. In this group you can ask questions and show your work so be sure to join the group if you have not already done so. If you would like to share your work, use the hashtag #NAS or #NutsAboutSquares so that I can easily find it on Facebook or Instagram. I hope you are as excited about Nuts about Squares as I am and I hope to see all of you March 31st when we start a new CAL together. Thank you, that is a really cool tool! that 5m difference should not be a problem. There will be a bit of yarn left at the end of the project. Yes, the sunkised is thinner than the other two yarns. You can easily extended the blanket by making more squares. We are now making 5×7 squares, you could do 6×8 for example. I would love to do this in thread. What would you estimate the size difference to be? Hard question. Maybe half of the DK yardage? Halló. 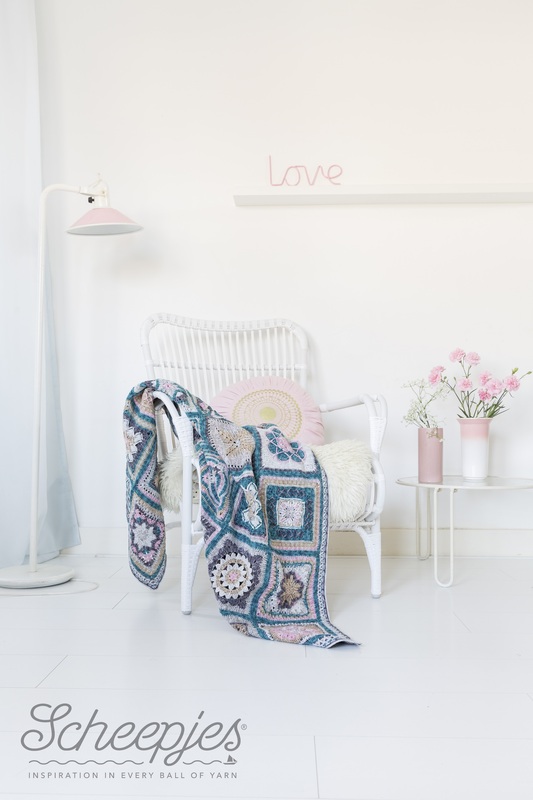 This blanket is very pretty, is it possible to buy the pattern, just the pattern and if so where can I do that. Thanks.